Along with colleagues Nikolay Damyanov and Lawrence Mysak of McGill University, Matthews decided to focus on backyard-style ice rinks, the kind Walter Gretzky famously used to make for his son. These rinks are more uniform than impromptu ones like frozen lakes, ponds or rivers, so there are fewer variables to account for. By calling around to the folks that maintain outdoor rinks in cities like Toronto and Montreal, the team was able to establish that it takes a minimum of three days of temperatures below -5 C in order to build up a good ice base. They defined this as the start of the outdoor skating season (OSS). Nothing lends scientific credibility quite like an three-letter-acronym. Defining the end of the season was much harder. Some outdoor rinks can survive several days above freezing, but others melt in a matter of hours. 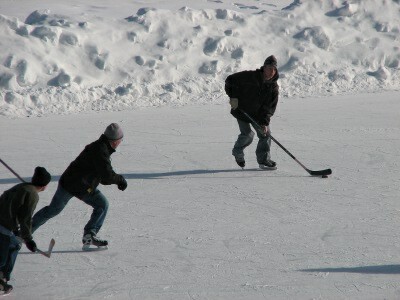 It all depends on how many extra layers of ice have been added, and that can only happen when temperatures are below -5 C. Because of this uncertainty, the researchers decided to define a proxy for the OSS as follows: the number of days below -5 C between the start of the season and March 1, when most outdoor rink enthusiasts pack it in for the season. Still, it could be argued that the most significant aspect of this study is the way in which it hits so close to home for Canadians, including some for whom climate change is not exactly top of mind. That fact has surely played a role in the ample media coverage of this study, and it’s a point that is not lost on Matthews. “I learned the other day that it was on the front page of the Calgary Herald, which speaks to a certain level of resonance. Global warming is not the most popular issue in Alberta.” Nor is it particularly popular with the Prime Minister, although he is a well-known hockey fan. To me, it doesn’t seem at all far-fetched to imagine that the threat of having no more backyard hockey rinks to nurture the next generation of Wayne Gretzkys will motivate Canadians to tackle climate change in a way that nothing else can.